Hello there! Laura Bassen here and I’m very honored to be joining the fine folks at A Blog Named Hero for their Christmas series. I have a couple of projects featuring some of my favorite Hero Arts products right now. 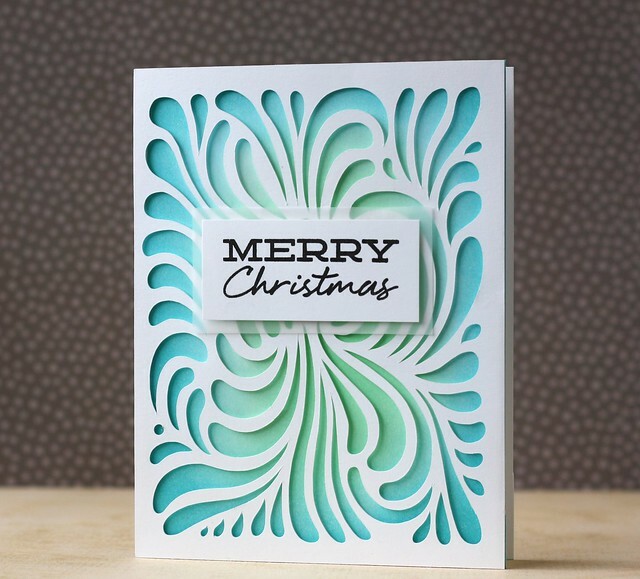 This first card features the drop dead gorgeous Swirly Background cut file that I used with my Silhouette machine. I added some color behind using Audrey Blue & Mint ink by Simon Says Stamp. I know this is probably a pretty nontraditional Christmas looking card, but isn’t she pretty? For my next card, I went hog wild with the Triangle Background die. I die cut four different shades of green card stock and pieced them together to create this cool pattern. Then I used my craft knife to cut a triangle into my front panel to pop up over the design. This was so fun to do. I know it looks like it would take a long time, and it did, but I loved every minute of it. Both of my cards use sentiments from the Banners & Messages stamp set by Hero Arts. Thanks so much for stopping by today & a big thank you to A Blog Named Hero for having me. 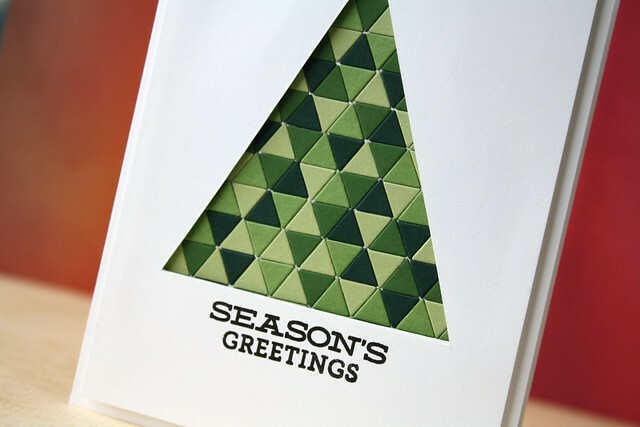 Here’s wishing you a wonderful holiday season! We have two $25 gift certificates from Simon Says Stamp as well as a prize package from Hero Arts to give away so don’t forget to leave a comment today, and on all of the posts this month!! All comments must be left here on ABNH, from now until December 4th. The winners will be drawn at random on December 5th and announced soon after. Hello and welcome back for another day of our month long Christmas celebration!! Steph here, and today I have a couple of holiday cards to share with you! One of my favorite things about the holidays is decorating the house! The Christmas tree, lights, garlands, mistletoe, and all the other festive decorations. I love some of it just because it’s festive and I think it makes my house feel homey, but I also love our decorations because many of them hold sentimental value and there is usually a story behind each item. My cards today go along with the theme of holiday decorations. I like to keep most of my cards clean and simple anyways, and holiday cards are no exception. I love to make cards that are easy to duplicate so I can make mass quantities to send out to friends and family. For my first card I used the Hero Arts Dauber Garland stamp and attempted to make them look festive and like ornaments. I colored the circles with copic markers and added some glitter from a Sakura Stardust pen to the gray circles, then I topped them all off with some glossy accents to (hopefully) achieve a glassy ornament look. Here is a better view of the sparkle and gloss! For my second card, I wanted to make something rather ‘classic’, so I stuck with kraft, black and just a bit of gold shimmer. It ended up extremely simple, but I really just had to let this beautiful Christmas tree stamp do all the work! I added glitter from a Sakura Stardust pen all around the tree (which I realize now is not very easy to see in the photo) and a hand drawn border around the edge for just a bit of sparkle. I added a gold gem to the top of the tree and that’s it! 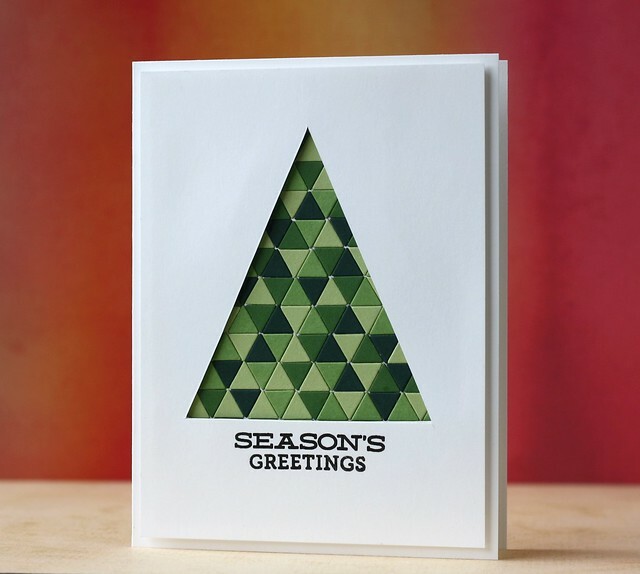 This card would be so easy to make 50 times, and it’s flat, which is always good for mailing! I hope you enjoyed and I hope you’ll keep coming back every day this month for more holiday inspiration!! We have two $25 gift certificates from Simon Says Stamp to give away so don’t forget to leave a comment today, and on all of the posts this month!! All comments must be left here on ABNH, from now until December 4th. The winners will be drawn at random on December 5th and announced soon after. here at A Blog Named Hero. Big thanks to Linda and Mary Dawn for the invite! My favorite thing about Christmas is of course, the Christmas tree. Here’s a shot of our Christmas tree covered with ornaments, most of which are handmade. ornaments every year, each one holding special memories. My card today features one of my favorite stamp sets from Hero Arts–Christmas Crystals. of Distress and Peerless Watercolors in each facet. I love how the color pools in some spots that gives the ornament a bit of dimension. I finished off the card with the hanging cord, some scattered stars, and a gold embossed sentiment. I’m so excited that it’s my turn to share a christmas project with you! Today is extra special, because we have TWO posts for you! I hope you’ve been enjoying the fantabulous inspiration that everyone has been sharing this month! My favourite part about the christmas holidays is the way our house looks extra pretty, as though it’s dressed up to go somewhere special, and the way colour is EVERYWHERE. It’s in the lights on the tree, in the ornaments and decorations around the house, in catalogues and stores, everywhere! Here’s what I made, something fun and simple–and easy to reproduce! I took three of the lovely snowflakes out of the Decorate your Holidays set, and stamped them randomly over the card front using different ink colours. I tried to ensure I worked in triangles with where I stamped each colour, so that the end result would be nice and even. I stamped the sentiment onto a separate strip of card stock, and then adhered that to a black mat, before adhering that layer to the card base! 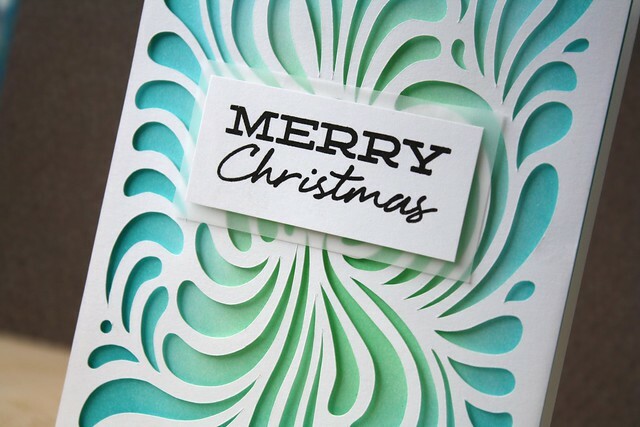 This card would be SO easy to masse-produce if you had your snowflakes all ready to go on separate acrylic blocks! For a final touch, I added some Wink Of Stella clear glitter to the snowflakes. I hope you and all your loved ones have a safe and happy holiday season! Be sure to come back later today (5pm) to see the beautiful card Donna has created! It’s Wanda Guess checking in with you today and I’m so excited to be back at A Blog Named Hero as your guest designer for today! Hasn’t this month been awesome? So many great crafters, and so much fabulous inspiration. I have really enjoyed looking at the posts each day….and now it’s my turn! Thanks Linda and Mary Dawn for inviting me! One of my very favorite things about the holidays is spending time at home… with friends and family, just relaxing and enjoying the season. I love to be in my pj’s around the fire watching movies and generally hanging out. The holidays to me are more cozy and homey… so, for my project today, I created a card using a cute row of houses. All the stamps I’ve used are from Hero Arts – of course! I am LOVING purple for Christmas this year! Seems like everyone is using a pretty shade of lavender or purple in their projects and I am too. Just something different and pretty. For my card I used watercolor paper and some distress inks, some heat embossing and a little dry embossing too. The stamp set called “Deer” is one of my fav Christmas sets from Hero Arts. It has these cool sentiments, the 25 banner and a big stag head! I did my heat embossing with white powder and Versamark ink on vellum. I always like that look. I took one side of the square and painted from the top down with my brush, then turned it over and painted the other color and let them run together in the middle. Here is what it looks like dry…. Don’t forget…We have two $25 gift vouchers from Simon Says Stamp as well as a prize package from Hero Arts to give away to random commenters on the blogs, all comments must be left on A Blog Named Hero, from November 1 – December 4. Winner will be drawn randomly on December 5 and announced soon after.